Are you looking for the best cable that will help you to charge your phone really fast? Does the design of the cable matter to you? If yes, this cable could be the best option and the solution to your problem. Wsken mini 2 micro USB cable has everything that you need, and it is quite fast too. Since it is the USB 2.0 data transmission cable, you can use it to charge your phone, kindle, camera, Bluetooth speaker, iPhone, iPad or any other Android device. Magnetic cables are the best solution when it comes to charging your devices. They are fast and reliable. Wsken is really good because it is durable and it has the LED indicator. This magnetic charging cable is quite cheap, and it is a high-quality cable that will always provide you with enough power for your phone or a device, whenever you need it. It is compatible with almost any device, and its modern design will make an excellent addition to your collection of gadgets. Rest assured that this product is the one that you are looking for. We will take a look at some of its features to bring closer to you how good this cable actually is. Read the magnetic charger cable review for more info. Due to the micro USB 2.0 cable, you will now be able to transfer data between your media device, tablet, computer or smartphone. This product will also faster your charging by the double. Wsken Mini 2 Micro USB magnetic cable is compatible with almost every mobile device available. From all sorts of iPhones, smartphones, tablets, cameras, Amazon Kindle, speaker and any other Android device with micro USB like Huawei V8, Google or HTC, and Samsung. It is only not compatible with Type C devices, and it supports fast charging. If you really want to faster your charging, this magnetic cable will do the trick. It can transport 2,4A and 3A currents for the most of Apple devices and Micro USB Android devices as well as 5V, 9V or 12V voltage for other different devices. This cord has been customized and optimized for the people that spend much time in the car. Since you need both hands when you drive, it has been customized so that it can be easily plugged or unplugged with one hand. The connector is magnetic, and it is easily removable and strong magnetism makes sure that the connector tips and the cable are properly connected at all times. It is precisely this attraction that makes connecting so easy. The best part is that you can avoid any abrasions at the point of connecting which supports the long life of this outstanding charging magnetic cord. Since it has been customized to suit the users’ need in the best way possible, the compact metal connectors will work with any cases, allowing you to make the most of this cable at any given opportunity. Since it happens that some individual devices just do not work with certain types of charging cables, Wsken has provided you with the LED indicator so that you can instantly know if your phone is charging or not. Once you plug it in, the indicator will simply turn on, and you are good to go. Also, with this LED indicator you will get 1 micro USB connector head, 1 lighting, and one cable cord. Feel free to use them however you want and make the best of your using experience. 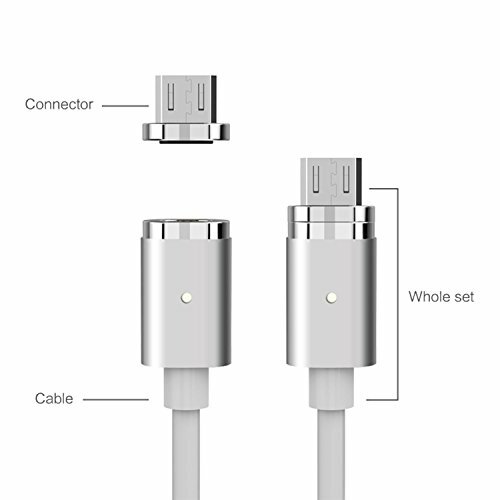 This magnetic charging cable is completely enough for any Android and Apple device because you can simply change the attached connector accordingly to the given situation. Since the connector was made of aluminum that was integrated with aerospace, this cable will do well when it comes to performance and durability. With the simple dismissing of nonsupport, you can easily use this magnetic cable for any IOS device too. The connector head has 8 pin lighting that will tell you if the device is charging or not. If the pins are not in order, the cable will not work. Once you make sure that the device is properly connected to the cable, you will get the message this accessory may not be supported. This can be easily solved by dismissing the nonsupport and ignoring it, and your device should start charging immediately after that. It can occur from time to time that the cable does not work or that it might come broken. If this is the case, the warranty can help you deal with this issue. Also, the cables tend to lose their fast charging capability after a period of time of time. Usually, it can happen after just one month of use, or it can never happen, depends on the quality of the product. The users tend to say that sometimes it only charges the phone up to 50% of the battery, but such cases were rarely reported. There are also some reports that say that the magnetic connection is not strong enough. In all cases, just report the issue to the customer service, and you should be getting a new one in no time. In case that you are looking for the perfect cable that will help you to charge your phone fast with the maximum effect, Wsken Mini 2 Micro USB cable will suit your needs just fine. It can be used on almost any device, it has many purposes, and it is effortless to plug and unplug it. It was specially customized for people who spend much time in their cars, and the cord was made of integrated aerospace aluminum to ensure the maximum durability and reliable performance. This product will serve you well, and it comes with 1 year warranty, just in case that something’s wrong. Overall, this is the best magnetic usb cable we came across.